Site Facilities: Toilets and cafe huts near slip, parking both sides of harbour but early arrival to get best parking close to slip, Air available in the village, plenty of free parking for the boat trailer. 31m, depth to top of wreck is 24m. A small british steam ship built at Newcastle in 1895. 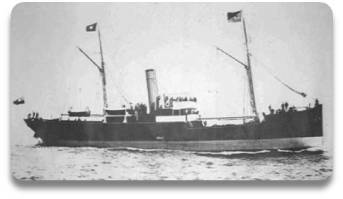 On September 14 1918, while on passage to France from Swansea with a cargo of coal, she was hit by a torpedo from UB-103. Twenty one crew, including the captain, were lost, only one man surviving – the Coxswain. The wreck is privately owned and you are not allowed to take anything. Also, even though we have never seen anything, human remains of the 21 crewmen who perished are still aboard – so please treat it with respect.